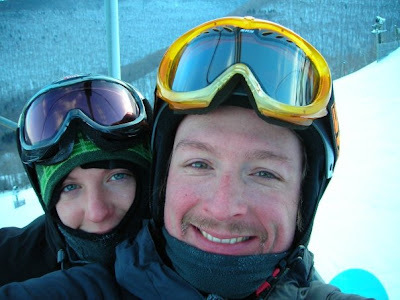 Yesterday (January 16), Roger and I met up with some friends and went snowboarding at Hunter Mountain. It was supposedly one of the coldest days (the car thermometer read 4 degrees when we got to the mountain). I could only imagine how cold it was at the top. We were wearing a lot of layers so I was actually sweating the whole time. 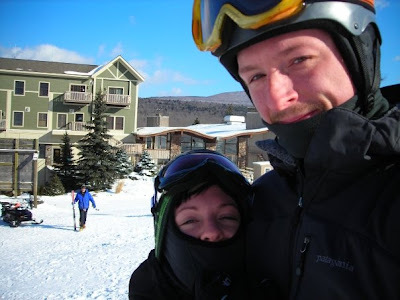 The cold weather kept most people at home, and we didn't have to wait at all for the ski lift. I wouldn't recommend going on a weekend however; I hate waiting on line for the lift. 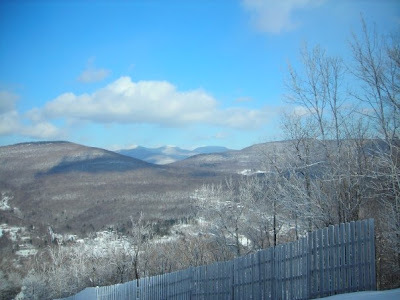 The sky was perfectly clear, and we had some great views of the Catskills (and some of the peaks we had climbed!) 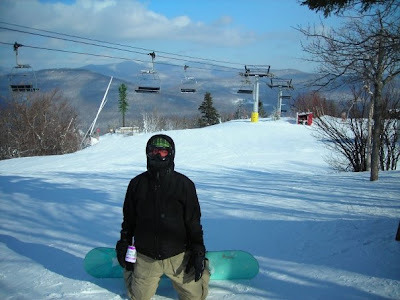 I had not been on a snowboard in two years! Horrible, I know. Needless to say my legs were hurting! I only stuck to the few blue square runs they had, not wanting to hurt myself the first time out. 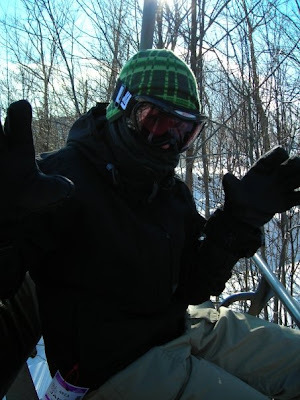 Roger, who looked very adorable in his snowboarding gear, went on his way down Hunter's diamond trails. At the end of the day when I was ready to take on one, it was getting very icy so I decided to hit my last run on the Belt Parkway. Of course, I hit some ice and went down on my tail bone. I'm a bit sore this morning, but partying later that night probably didn't help. All in all it was a good day. 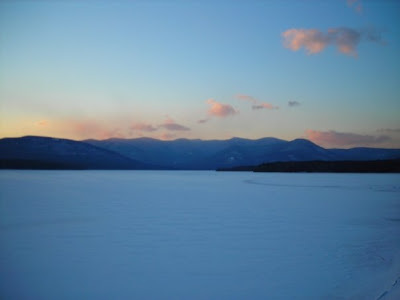 Roger took some really beautiful pictures on the way home driving past the Ashokan Reservoir. Bundled all the way up! It looks like it was a beautiful day! 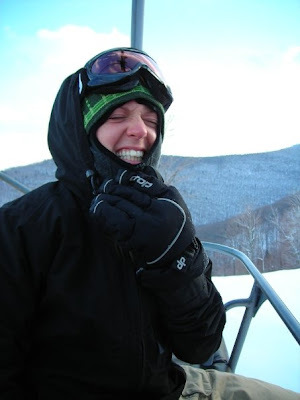 I've always wanted to try snowboarding but I'm not sure where a good place to start would be. Any suggestions? In this area, Hunter would probably be best. 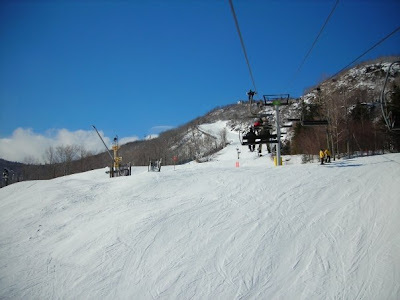 During the week they have cheap rentals and one whole side of the mountain is easy runs. 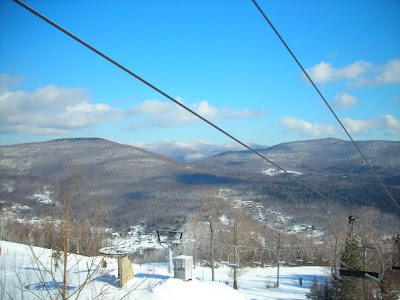 Belleayre Mountain is also nice, but smaller. 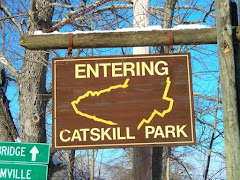 The Catskill 3500 club is open to all who frequent and love to hike in the Catskill Delta Region, located half an hour south of Albany. 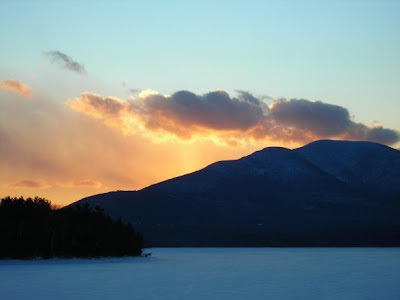 The Club was founded in 1962, and requires all members to climb 35 Catskill High Peaks, some repeated in the winter months from December to March. My blog will chronicle a beginning and an end. While always a lover of outdoor activities, and most recently the Hudson Valley and New Paltz specifically, I am just beginning on my hiking journey, while my "guide" and boyfriend is finishing up his (at least the part where he becomes a member of the 3500 Club). 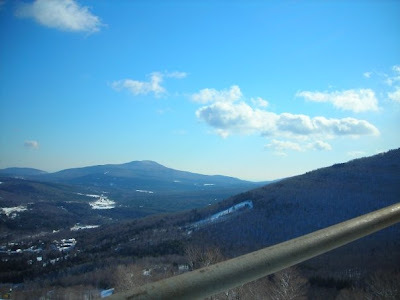 Roger is a New York State certified Rock Climbing and Hiking Guide, and has thus far completed 29 peaks, 16 of which he completed during winter months. The last two recent peaks Roger completed, I had the pleasure of accompanying him, and I caught the bug, or "itch" of needing to push myself to the limit in beautiful and sometimes dangerous surroundings. My next great endeavor will be to learn how to rope climb. But, we will have to wait till the Spring for that. Until then, bring on the snow! Photographs used in blog are courtesy of Roger C. Ennis and Rachel M. Williams, on a Canon Powershot SX10 IS. Information and knowledge courtesy Roger. The PGK Blog; only the str8est of dope.